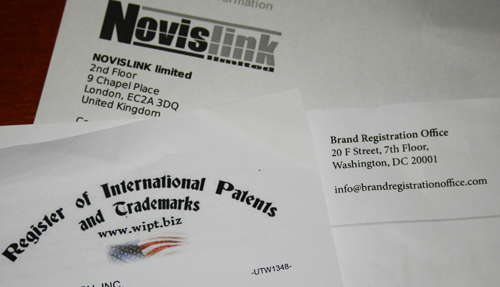 If you've received a trademark in recent years you may have also received official looking solicitations disguised as invoices from companies such as Brand Registration Office in Washington DC, Novislink in London and WIPT in Bratislava, Slovak Republic. The invoice amounts range from $1,200 to $2,738 but, to the best of our knowledge, the services offered are worth $0. If you seek to protect your trademark beyond US registration please check with a reputable trademark attorney. Similar so-called services are offered with regard to patents too. Pay attention. If you didn't agree to a service in advance you shouldn't pay for it.